Notes | A truly successful photographic career means not only financial success, but also personal satisfaction and fulfillment. The goal of Best Business Practices for Photographers is to help you achieve success in each of these areas. This book is not a guide to taking better pictures or selling your photography. Instead, it explains how photographers can meet important business objectives. It covers the focal points of best practices?best practices in interacting with clients, best practices in negotiating contracts and licenses, and best practices in business operations. It provides a roadmap for successfully navigating these?and many other?issues facing photographers today. John Harrington has built a photography business that has been successful, with income having risen ten-fold since he started. He is a teacher that can communicate to an audience. He has spoken in the past at courses and meetings of The NPPA's Northern Short Course, The White House News Photographers Association, Smithsonian Institution, Corcoran School of Art and Design, American Society of Media Photographers Capital Region, University of Maryland, Northern Virginia Community College, Trinity College, and the Northern Virginia Photographic Society. He has worked for over 16 years as an active photographer in Washington DC and around the world, working with both editorial and commercial clients. Editorially, his credits have included the Associated Press, New York Times, Washington Post, Time, Newsweek, US News and World Report, The National Geographic Society, USA Today, People, MTV, and Life. For corporate and public relations clients, John has successfully placed images with the wire services (Associated Press, Reuters, Gannett, Agence France Presse, and UPI) over three hundred times. Commercially, John has worked with well over half of the top fortune 50 companies, and even more of the top 500. Ad campaigns for Seimens, Coca Cola, General Motors, Bank of America, and Freddie Mac, to name a few, have been seen worldwide. Comments | [05/03/07] I've just begun to read this book and already feel my business is going to be a greater success due to the info provided. Buy this book, you won't regret it! Comments | [04/04/07] I haven't even finished the book yet, and it's already worth every penny. I expected a "business" book about my profession to be Ho-Hum (boring) but this one has kept me glued. It's current, well written and a valuable resource that is more than a one time read. Comments | [03/23/07] Much of the tax info/etc is inapplicable to non US based photographer, but even so this is a "must have " for anyone serious about the business, John's detailed negotiating and follow up practice models will help us all survive far more than another book on photoshop! Comments | [02/10/07] Greatly Informative for anyone, especially for a student like me that would like to make a comfortable living from freelancing. It simply raises issues and concerns that many overlook. Comments | [02/06/07] An outstanding and informative book. One of the most engaging books I've read, photography or otherwise. Mr. Harrington is a terrific author and provides excellent insights based on many years of professional experience. The real life scenarios and advice in this book are worth much more than the $20 investment to purchase it. Comments | [01/11/07] Great read! I finished Ch 13 last night and can't wait to read the rest of it. What I like most about the book thus far is how John can put in words what I've thought and tried (unsuccessfully) to communicate to people I've dealt with in the past. He lays things out in a simple, easy to understand manner. The negotiation chapter has been the most helpful. All photogs, especially freelancers and commercial/portrait photogs, need to read this book. Comments | [01/03/07] Everyone should buy this book. John has boiled down, through research and experience, a career's worth of good business techniques that, if studied, will net you and all the rest of us more money. If you claim to be a professional photographer, you must read this book. Comments | [12/25/06] I received this book today, Christmas, and I am already finished reading it. The book is well written and extremely insightful. For a young student this is the perfect book. To often we focus on the images alone. 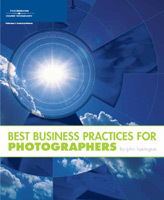 Mr. Harrington's book explains the business aspect of photography in concise and understandable terms. Great, quick, insightful read. Comments | [12/11/06] As a student going to be setting foot out on my own in the next couple of years I know that I will be starting out on the right foot after reading this book. It is something that is going to remain on my desk as a constant reference as how to handle my business and my clients. It doesn't matter if your a working photographer looking to update your business skills or a student like myself looking to get started on the right foot, this book is something that I highly recommend reading and keeping by you to refer back to, I know I will be. Comments | [12/03/06] This is definitely a book that every working photographer should buy, read, and then keep on his or her desk as a handy reference tool that will be read and re-read for years to come- or until John writes a follow up version. So many wonderful tips and real life stories that illustrate what it takes to survive as a photographer in the ever-changing landscape of this wacky business we are all attempting to stay afloat in. If you have a question about running your own buisness- be it about liability insurance, finding an accountant or purchasing a new piece of equipment- this book has the answers. Those of you that have newspaper staff jobs should also buy this book as you never know when you will find yourself on the street needing to freelance full-time after you get laid off (especially if you work for a Dean Singleton-owned newspaper). Go out and get this book today! Comments | [11/21/06] This book is a must if you plan on actually making a living as a photographer. John Harrington stresses that you MUST know what it costs to be in business in order to determine how much you NEED to charge to STAY in business. You could easily end up paying your clients if you don't spend some time doing your math. He also urges you to walk away from bad deals. Even if you're a staff photographer with a steady paycheck it is worth reading. And students, prepare for a reality check.